Numerous organizations around the globe still use Exchange 2003. The reasons for that are various – after 10 years on the market, administrators know the program inside out, server machines were powerful enough to suit companies’ needs etc. However, ten years in the IT industry is a whole era and much has changed. The explosion of mobile devices that are accessing Exchange mailboxes directly, the Cloud, the release of MS Exchange 2013 and many other factors are making the 2003 version obsolete. Not to mention that in 2014 Microsoft terminates technical support – no more patches, updates and security fixes for Exchange 2003. These reasons are pushing many administrators to consider migrating to more modern solutions, such as Exchange 2013. The sad fact is that Microsoft provides no way to migrate/upgrade Exchange 2003 directly to 2013 at this moment. It doesn’t mean, however, you are left with no options if you would like to move straight to the newest version of Microsoft’s email platform. There are several solutions you can consider. The first one is the “double hop” migration. Exchange 2003 and Exchange 2013 can’t co-exist in one Active Directory forest. On the other hand, moving users’ mailbox data between two different forests is complicated when you want to use only native migration tools. We can complaint about Microsoft’s policy on that matter but it will still remain a fact. Currently there is no native path to make an intra-organizational upgrade from Exchange 2003 to Exchange 2013. For that reason many system engineers recommend to split the process into two steps: First upgrade Exchange 2003 to 2010 version and then migrate to Exchange 2013. This method is called the double-hop migration, which obviously doubles the work required and the risk of the process going awry. It also requires some important resources, like spare hardware (if you have it), or putting up additional virtual machines only to host the temporary environment before moving it to the target location. The entire operation must be planned and done with maximum care, in order to reduce the downtime of mail servers. Will you take that risk? Export/Import PST – good idea? If you operate on a small amount of users working on PST files during the migration can work for you in a way. However, the thing might not be as simple as it seems. Not to mention the fact that the manual export/import operation between the two versions of Exchange might be a bit of time consuming, you might face some other problems which will make the whole process even longer to complete than you initially thought. The first issue is connected with legacyExchangeDN X.500 address that will have to be manually added to each re-imported mailbox as proxy address in the target location. If you don’t do that right after re-creating the mailboxes in Exchange 2013, your users will not be able to use their email in a normal way. The solution to that is quite simple, but obviously it adds some extra work to the entire migration process and carries a risk of longer service unavailability during the migration. You will find more information on that topic here. You can also use this article as a guide. The steps described in it can be used with an on-premises installation of Exchange 2013 as well. Another important problem to consider while using the export/import PST option are public folders, if you use them. Re-importing them in the target location will not recreate the folder permissions and you will have to set them manually. If your organization uses a complex public folders structure, re-creating the permissions can obviously become a nightmare. Eliminating the above mentioned limits will help you cut down on resources, lead to a shorter total migration time and reduce the risk of service downtime. CodeTwo Exchange Migration – how does it work? 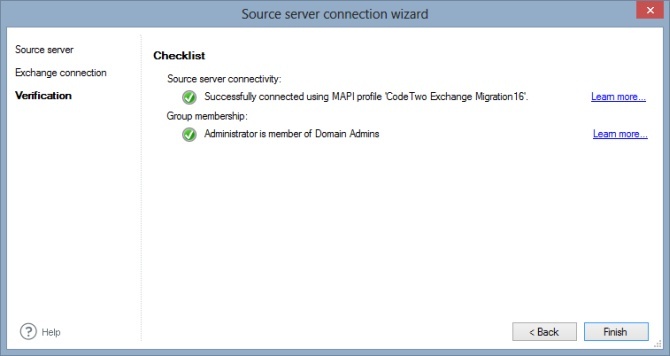 CodeTwo Exchange Migration is an easy to use desktop application that can be installed anywhere in the source Active Directory domain. It has to be installed on a Windows profile of a domain administrator, either on the server, or any workstation connected with it. One of the biggest advantages of the program is that it is a self-service application. It is the administrator who manages the migration and no 3rd parties are involved in the process at any point. Connecting with the source Exchange 2003 domain and listing the mailboxes. Connecting with the destination Exchange 2013 domain. Matching the mailboxes on the source and target server’s end. Launching, or scheduling the migration. Checking the status reports and log files and post-migration cleanup. The program comes with two convenient connection wizards that help the administrator establish a connection with the source and destination Active Directory domain. They also help verify if the environment is ready to launch the migration and identify possible problems, if there are any. One of the biggest advantages of CodeTwo Exchange Migration over the native migration tools is that it supports operating on mailboxes in bulk. 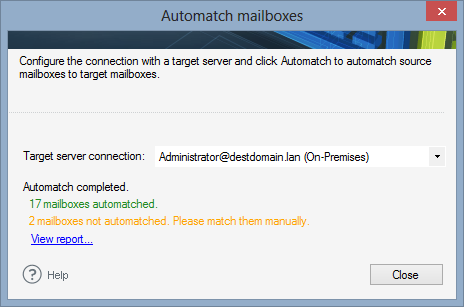 The built-in Automatch option allows to automatically match the mailboxes on the source and destination server’s side. While running the migration, a few mailboxes can be copied at a time, accordingly to the program’s settings and Exchange Server throttling limitations. Although the mailbox migration doesn’t have any direct impact on the email service availability, the large amount of data that is being transferred across the network may affect the overall network performance. 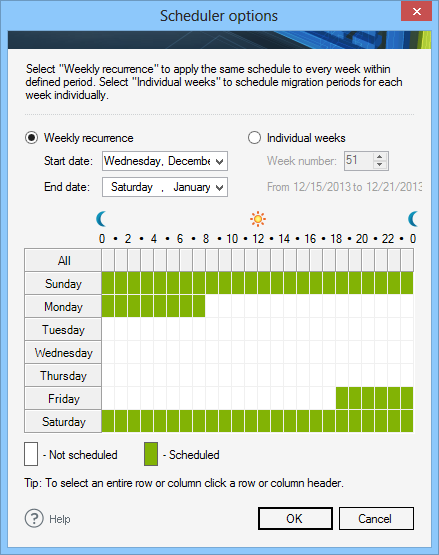 Therefore, it is wise to perform the migration during weekends, or in the hours when users are not at work. The built in Migration Scheduler allows the administrator to schedule the exact time frames when data is supposed to be copied. For system administrators time is essential, especially when migrating Exchange. Moving data fast, properly and smoothly is a dream. Double hop migration can turn that dream into a nightmare, whereas exporting/importing PST files across forests doesn’t work in large companies. Therefore, it is always worthwhile to check for alternatives just like the CodeTwo migration tools. Want to migrate to Office 365? Try CodeTwo Office 365 Migration. With using Resource forest but without domain migration, how can i perform the up gradation of Exchange 2003 to 2013 ? If I understand you correctly, you want to migrate Exchange 2003 to 2013 to a different forest but without changing your domain? I’m afraid this scenario won’t work. When migrating Exchange 2003 to 2013/2016, I can recommend CodeTwo Exchange Migration in cross-forest, cross-domain scenario. I really don’t see the point of this. It is no different from migrating to 2010 and then on to 2016 because your software does not allow 2003 to 2016 in one hop on the same domain. Someone needs to produce software that will take an offline backup of 200x and allow you to uninstall your 200x, install 2016 and then restore the mailboxes from the offline backup or better still the .EDB file copied from the original server. Why has nobody done this? It would save so much time and money. Our migration software has helped many companies save time and resources in many different scenarios, especially in cross-domain migration. Thanks to CodeTwo Exchange Migration, they were able to perform a quick and secure data migration without double hopping and with zero downtime for users. Nonetheless, thank you for your opinion, our developers will take it into account while working on the new versions of the program. Apart from that, you can use CodeTwo Backup to create an offline backup of your mailboxes and then restore them, just like you specified in your comment. can you please tell me the pre-requisites for migration of ex 2k3 to 2k13. Does this problem affect all mailboxes? 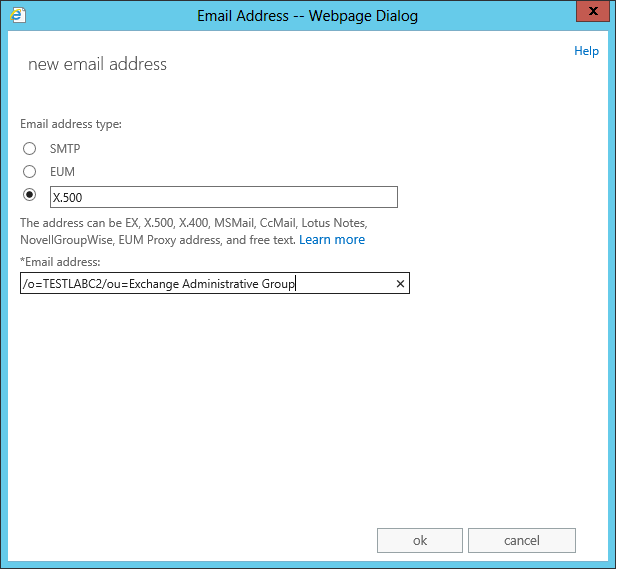 Have you tried to create a new Outlook profile and configure it with Exchange Server 2013? You may also find this thread on Experts Exchange helpful: https://www.experts-exchange.com/questions/28199246/Outlook-2013-or-2010-will-not-connect-to-newly-integrated-Exchange-2013-Server.html. There is a solution from PureTech who suggests that the problem may be caused by the CAS Mailbox property MAPIBlockOutlookRpcHTTP set to “True”. Let me know whether it helps. If you need to keep your existing local domain, the steps you mentioned seem to be correct. CodeTwo Exchange Migration could help you with the Exchange 2003 to 2016 cross-forest move. Service availability would not be affected, because our product only copies data to the target server. The only time users may “feel” the migration is when you switch your MX records to the new server. looks like a very interesting product. We are looking to migrate our Exchange server from 2003 to 2016. I m aware they both cannot coexist on the same domain. Would i therefore have to create a new domain for the exchange server, remove old server from current domain, then add new exchange server to domain? If so, i’m guessing that users will not be able to send/receive email untill this has been completed? first i am sorry about my bad english. 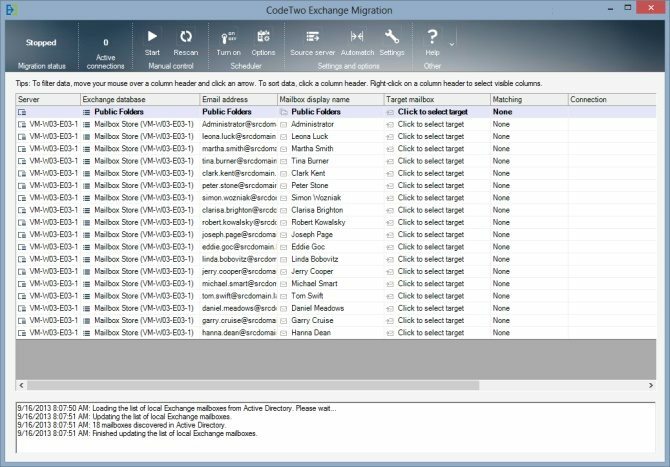 When migrating mailboxes you can use our CodeTwo Exchange Migration tool (http://www.codetwo.com/exchange-migration/?sts=3015) or Exchange’s native tools. 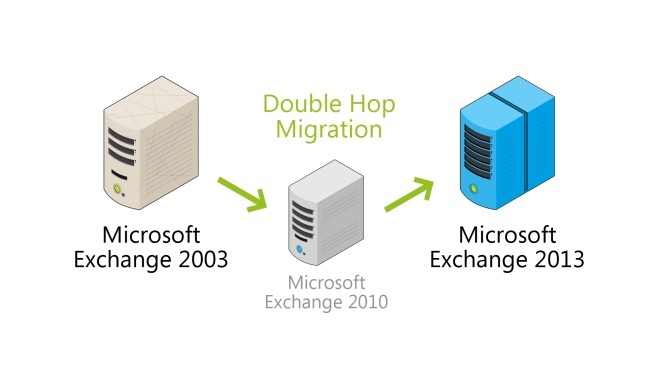 Used your product to migrate from Exchange 2003 to Exchange 2013. Had a few issues but am generally satisfied with the data move. However, the destination server reports the mailbox versions as being Exchange 2003, not Exchange 2013. Therefore, Role Assignments are not possible, which causes a number of problems. Now that the old server is gone, what can be done to “promote” or upgrade the mailbox versions? This looks like something our Support team would have to investigate. Please contact them any time between Monday and Friday: http://codetwo.com/company/contact/?sts=3015. My forest is forest.com, and my exchange 2003 server is located in domain1.forest.com. Can I install exchange 2013 at the root level, forest.com? Or do I need to create a new root level, forest2.com and then install exchange 2013? You need to install Exchange 2013 in a separate forest. Exchange 2013 can’t co-exist in one forest with Exchange 2003. I’m currently in a process to migrate WS 2003 to 2012, from AD, Files, Exchange and user redirections. Is there anything very important to know about except what has been mentioned above? or a website can help a me through the process? @Don J – it is really hard to tell as the migration process relies on many factors, such as quality of your Internet connection (in the case of a migration to a different network), your local router throttling, source and target server throttling, performance of the computers involved etc. Our program does not affect the speed you already have at disposal in your environment. @Francesco Pellegrini – I am not entirely sure what do you mean by asking about customers that are not using Microsoft Exchange. Most probably, just as you pointed out, they have their own paths of migration and upgrading their non-Exchange environments. The article covers MS Exchange migration. How long would it take to do the mailbox transfer for 60 mailboxes with about 70GIG in the mb store? What happens to those customers who decided to stay away from Microsoft Exchange? Upgrading a Lotus Domino R5 server to IBM Domino 9 takes 15 minutes. Launch installer, click, click, click… done. Restart server and tell users to connect. Thanks Joe! If you need any assistance, just give us a shout. Thanks for this write up! I’m testing your tool. It looks promising. Where did you see that Exchange 2013 SP1 will offer coexistence with 2003? Microsoft offers coexistence with Exchange 2013 SP1. Check it out. Still no direct path from 2003 to 2013. You must still stage it with 2010 or use 3rd party tool. Microsoft does not support coexistence scenario between Exchange 2013 and Exchange 2003 (and older) unfortunately. 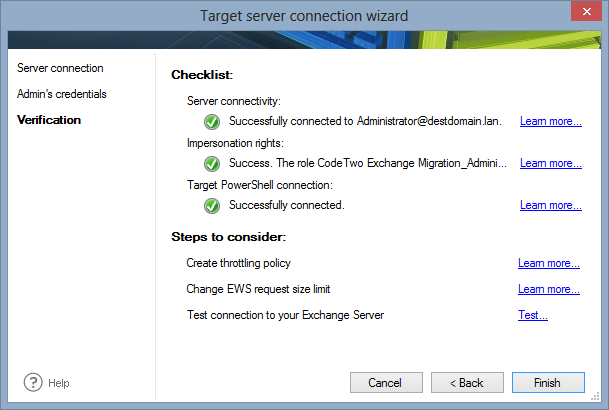 When migrating the process requires creating a new, separate domain on Exchange 2013. I’m very interested to your product “CodeTwo Exchange Migration.” to migrate from Exchange 2003 to Exchange 2013 directly, without intermediate steps. “One or more servers in the existing organization are running Exchange Server 2000 or Exchange Server 2003.Installation can’t proceed until all Exchange 2000/2003 servers are removed”? Ps. :I have more than 200 mailboxes.